This stunt-racing game is based on stunt driving, a popular extreme sport nowadays. 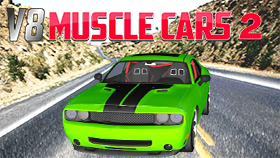 In this game, you can freely perform loads of cool and beautiful stunts in this driving game. There are three film selects, each film select will have its own tasks to complete. If you first play the game, you need to finish the first film select to open the next one. The task may be reach 100 meters, get three great launches or smash three car boxes. After you complete a task, the game will set another one for you to continue. You also can go to the shop to purchase some new items like the fuel tank, the roll cage, the engine so that your car can be upgraded. After counting down from three to one, you can let the car go by tapping spacebar to set your launch speed from two to eleven. Each task requires you to choose different speed for your car. So, try to adjust the speed suitably. This game is somehow difficult as you have to complete all required tasks to win. If you are new to Stunt Driving sport, you may find it hard to play this game at some first try. But when you get accustomed with it, you will sure have a lot of relaxing and amusing time playing. Currently, you can try the unblocked version of Stunt driving here if you want.